The product owner, development team and scrum master have distinctly different roles. The product owner is clearly the person responsible for building the right thing but sometimes the development team just think they are there to build what they are told – this is not the case at all, the development team has many more responsibilities such ensuring reliability, scalability, alerting, monitoring, and many more. The scrum masters role is to remove impediments and to make sure the development team is able to work as fast as they can. All three roles are responsible for the product being functionally appropriate, technically competent and delivered without delay. 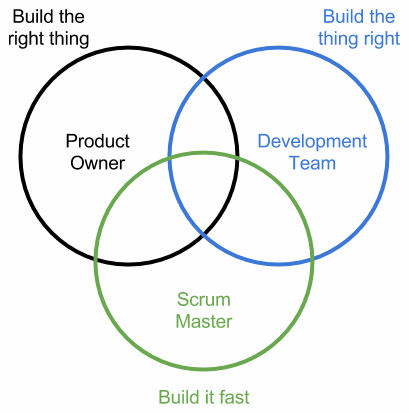 Product Owner – Build the right thing; Development team – Build the thing right; Scrum Master – Build it fast. Everyone is responsible for the product.